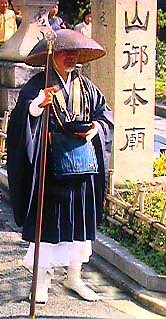 When you approach the gods in Japan, whether the kami at a Shinto shrine or the Buddha at a temple, there is a series of actions that you usually follow to get the gods' attention. At a shrine, you clap your hands in front of the coin box. At a temple, you ring a bell over the coin box. But in both cases, before making noise, you throw a coin into the coin box. If you want the gods to hear you, pay in advance. I will take your requests and thanksgivings to the gods whether you are able to help me or not. But the Bible says, "As you sew, so shall you reap." In more contemporary terms, "What goes around comes around." If you really want what you're asking for, or if you're really thankful, you will share not only in the benefits of my journey, but in its hardships as well. That is, you'll give me money. They say that the Lord helps those who help themselves. Well, maybe the Lord helps those who help me! There are other ways to support me, of course, and many already have: helping me with translation, helping me promote my site, etc. Another way to help is to pray for me as I pray for you. When the Edo-period Japanese appointed a lobbyist to the gods, they also paid his way, and did his work and cared for his family while he was on the road. I have no work or family to tend to, but I will have expenses. I will be unemployed and homeless for three months. Walking is free, but eating is not. There will be some lodging expenses (though I'll often sleep outside). And putting up my homepage daily will involve Internet and telephony expenses. Just camera batteries alone will soon add up! Please tell me the amount you wish to contribute, and I will send you information on how to make a deposit to my bank account. Business owners may also want to consider official sponsorship of my walk. Check out my list of donors.